Photo courtesy of Ethan Wasserman. Friday, Feb. 15, the RAM Initiative students and their peer mentors took time out of their busy schedules to chat with The Quad. Emily Catherine Scott is one of the first RAM students at West Chester University. As a student, Scott works hard in her classes to get good grades. Scott is an active member in Best Buddies, Autism Speaks, SAC club (Student Activities Council), CEC (Council for Exceptional Children), Adaptive PE club, and Special Olympics. “We go to classes; we get twelve credits. It is a wonderful program. The peer mentors help the students, like Nate and I,” Scott says. Scott is working on trying out for the cheerleading squad and has an internship. On Mondays, she sets up trays with ingredients for a nutrition class. On Wednesday mornings, she cooks and sets up an oatmeal bar for the faculty. Nathan Seagraves is another RAM student at West Chester University. As a student, Seagraves jokes, “I study…sometimes.” Seagraves goes to class and interns at the WCUTV weekly and our very own WCUR radio station in Sykes. He takes pictures, and also meets with and socializes with his peer mentors. One of the peer mentors for the program is JoAnn Clark. Clark works to help the students in the RAM Initiative program achieve their academic and social goals in any way that she can. Clark works as a point of contact with other clubs on campus to communicate, promote inclusion and educate the people of West Chester University about the RAM Initiative. I got to hear from Dr. Lepore, who is often referred to as “Doc” by her students. Dr. Lepore was part of the team that devised the program, wrote the proposals to the university, Middle States Commission for Higher Education and to the U.S. Department of Education, for the program to be official. Besides doing things like writing grants, proposals and public relations pieces for awareness, Dr. Lepore oversees the day to day operations of the program. And oh my, does she do a lot. Dr. Lepore meets with the RAM Initiative students, confers with faculty on modifications needed for students and helps mentors and GAs to plan homework time, class support and seminars—a busy lady, for sure. So, what is the RAM Initiative? Walk me through the process. How does a qualifying student apply for the RAM Initiative? What happens once the qualifying student is accepted? How is the RAM Initiative college experience different? What kind of aid is provided in the difficult transition every young person faces from high school to college? What does RAM stand for? It’s not just a pun on our mascot, I’m sure. 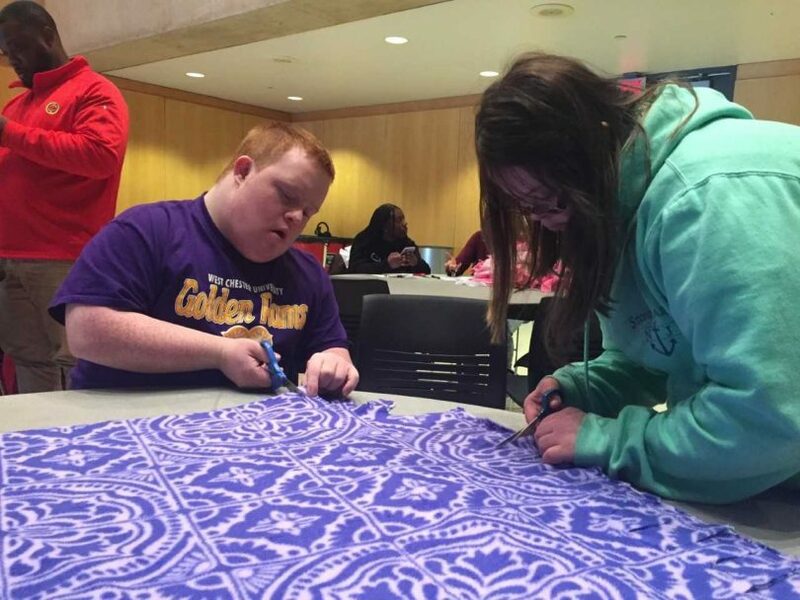 “It is important to teach individuals with intellectual disabilities the skills they need to succeed once they are faced with real life challenges. The RAM Initiative allows them to interact with people who they otherwise might not,” Clark states. Where is the ‘home base’ for the RAM Initiative? “We meet a lot at Doc’s office,” says Seagraves. Dr. Lepore warmly describes herself as the home base for the RAM Initiative. What does the RAM Initiative do for our West Chester University community? Why did you, personally, choose to get involved in the RAM Initiative? Is the RAM Initiative active on other campuses? If not, is that something that the initiative is working toward? What else would you like West Chester to know about the RAM Initiative? “That’s it’s a lot of fun to be a student at West Chester.” Seagraves says.